No matter what our dietary needs have been over the years, we have tried to find ways to make our favorite fun foods during the holidays. Pizza with a Halloween theme is one of those foods! Suggestions for alternate crusts for people who are gluten-free, on a low-carb or paleo diet, or are raw foodists are offered below. Black olives, pepperoni, green olives, peppers, mushrooms, ricotta cheese, spinach, sausage, meatballs, etc. When your pizza is the way you want it to look, put it on a foil covered pan and cook it in a 350 degree oven until the cheese is melted. Enjoy when cooled. Here are a few suggestions for making pizza with a Halloween theme. Feel free to come up with your own version with your favorite toppings! Pumpkin: Yellow cheese, sauce, black olives, pepperoni and peppers for the eyes, nose and mouth. Frankenstein: Cheese, sauce, green olives or spinach for the face, black olives for the hair, mushroom slice for the nose, pepper slice for the mouth and pepperoni eyes. Tip: Ricotta cheese can be mixed with spinach to make a green face as well! 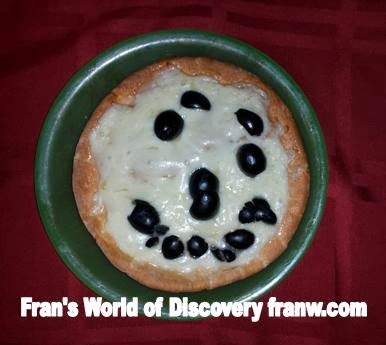 Ghost: Cheese: Ricotta and/or white cheese of your choice, black olives and/or pepperoni for the eyes and mouth. Dracula: White cheese and/or ricotta for the face, sauce, chopped black olives for the “V” hairline, a slice of red bell pepper for the mouth, green olives for the eyes and a slice of mushroom for the nose. For those of you who are on a special diet, or like to eat a certain way, and would like to make these fun Halloween treats, the following crusts can be used. If you have a favorite gluten-free pancake recipe, make a batch without sweetener and add a small amount of herbs and grated cheese instead, then cook as you normal would, but make each pancake larger for personal-sized pizzas. Once all the “crusts” are made, have everyone top them with their favorite ingredients, heat them in a 350 degree oven until the cheese melts, and enjoy. To make personal-sized low-carb crusts, beat 2 eggs in a bowl, season it with salt, pepper, Italian herbs and grated Parmesan cheese, pour it into a hot oiled pan and cook it on both sides before adding your toppings. Put it in a 350 degree oven to bake until the cheese melts. Everyday Paleo offers a recipe for a pizza crust made with almond flour. Use your favorite raw pizza crust and sauce recipe and top with fresh raw veggies and nutritional yeast, or you can use this Raw Food Pizza Crust recipe made with a base of ground flax seeds, cauliflower, zucchini and spices. Make these a day or two a head of time and store them in the refrigerator in an air-tight container until needed. A ‘white sauce’ can be made with pureed cashews and nutritional yeast.